Denny Morrison reached a milestone with his 40th individual World Cup long track speed skating medal, his first of the season, while Ivanie Blondin captured her sixth World Cup medal of the season, Sunday, at the ISU event held in Hamar, Norway. Morrison, 29, of Fort St. John, B.C., won a bronze in the 1500m and Blondin, 24, of Ottawa, took silver in the women’s mass start. Morrison’s time of one minute, 46.03 seconds, Sunday, was one hundreth of a second away from his best time of the season which stands at 1:46.02 and was registered in the 1500m held at the Canadian Single Distance Championships, January 2, in Calgary. Denis Yuskov of Russia won gold in Sunday’s race (1:45.07) while Kjeld Nuis of the Netherlands took the silver (1:45.80). It was Morrison’s first medal of the 2014-15 World Cup season, after he came up with two fourth-place finishes in the 1500m, Nov. 16 in Obihiro, Japan, and Nov. 21 in Seoul, South Korea. Morrison, who has won four Olympic medals over his career, claimed his first individual World Cup medal on Dec. 10, 2005 with a bronze in a 1000m in Turin, Italy. He claimed a silver in the 1500 the next day. Including the team pursuit, Morrison now has 52 team and individual World Cup medals to his credit. Alec Janssens of Chilliwack, B.C., was 18th in the men’s 1500 A group race, with a time of 1:50.01. Blondin was edged out by 0.04 seconds at the finish line by Irene Schouten of the Netherlands in the women’s mass start. Blondin now has five mass start medals this season, including two gold. She also has a bronze in a 5000m race. Earlier Sunday, Blondin was disqualified in the 3000m after she stumbled and kicked a block separating the two lanes. It cost Canada a quota spot in the women’s event at the World Allround Speed Skating Championships in Calgary, set for March 7-8. Christ, of Regina, was 13th in the mass start. She was also ninth in the women’s 3000m B race (4:15.32), followed by Isabelle Weidemann of Ottawa, 18th (4:18.20), Josie Spence of Kamloops, B.C., 19th (4:18.68) and Nicole Garrido of Edmonton, 23rd (4:20.21). The Hamar World Cup was the final qualifying chance for the upcoming World Allround Speed Skating Championships. 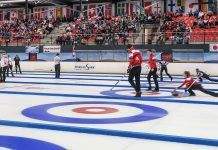 Canada earned two quota spots for the men and one for the women. Morrison and Blondin had already pre-qualified for the championships. Canada’s second quota spot for the men goes to Ted-Jan Bloemen, of Calgary. “I’m really happy to have qualified. It’s a big event and I’m looking forward to representing Canada on our home-ice in Calgary,” said Bloemen, who moved to Canada last summer from the Netherlands to skate for his father’s home country. Bloemen placed fifth in Sunday’s 1500m B race, in 1:49.19. Stefan Waples of Winnipeg was 24th (1:51.02) and Jordan Belchos of Markham, Ont., 37th (1:53.11). Rob Watson of Whitby, Ont., was 11th in the men’s mass start race, while Stefan Waples, of Winnipeg was 20th. The Canadian team now prepares for a World Cup in Heerenveen, Netherlands, Feb. 7-8. Heerenveen will also host the World Single Distance Championships, Feb. 14-16. More information can be found on Speed Skating Canada’s website: www.speedskating.ca.